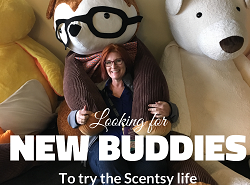 Laurie, Orville and I were inspired by your attitude, encouragement and love for Scentsy and its’ products. 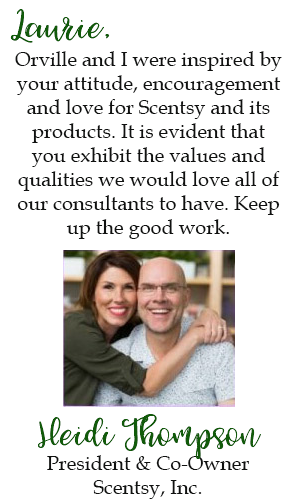 It is evident that you exhibit the values and qualities we would love all of our consultants to have. Keep up the good work. – Heidi Thompson, President & Co-Owner Scentsy. Inc.
Orville has read many of your posts in the past and has been impressed, as I have been, with your ability to be consistently accurate. Your posts are always calm, even-tempered and steady. 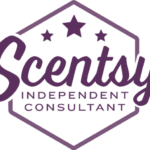 – Chuck Thompson, Chief Culture Officer, Scentsy, Inc. It was such an honor to attend a Body Language class taught by Laurie Ayers at our Scentsy Leadership Training this fall!!! There were many things that I learned from her that I can apply to my business that will help me be even more successful!!! We only have a few seconds to make a first impression with others we come in contact with … I want to make them count. Thank you, Laurie!!! I know Laurie is an excellent Sponsor. We all can become excellent sponsors and leaders if we really want to be and apply what our Upline has told us and if we remain teachable! **Thank you for sharing this! I appreciate your willingness to share so that if we have “ears to hear” we will learn! Sadly, I am afraid not everyone has ears to hear. Thanks again for your advice! **Well spoken by someone who spouts off P&P [policies & procedures] like they wrote it. **You always have such great advice on here [consultant forum]. I appreciate it very much. **I love how you always answer questions using quotes from the handbook…helps everyone focus on the “official” answer. Thanks!